Flames that sputter low and cold. A steady fire all through the night. 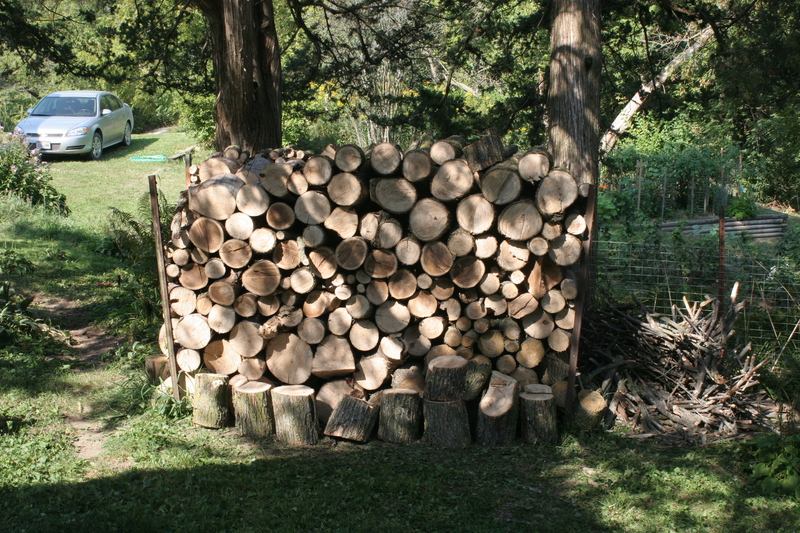 To heat your home with a wood stove, you have to enjoy cutting and splitting wood. Oh, you might get by for a year or two on the fallacious belief that you are befriending the forest eco-system, or the erroneous idea that there is economic benefit in heating with wood rather than fossil fuels. But to keep at it for year after year, twenty or thirty years, you’re going to have to really like the heavy work of cutting and splitting and hauling and stacking firewood. Love it, in fact. Do it not as a noisome ritual of September and October, but as a fun and rewarding labor of love. Recreation. Play time. Otherwise, you are going to ditch the wood heat experiment after a winter or two, except for lighting a token fire in the stove for atmosphere when friends visit. You’ll nibble cheese and crackers and sip glasses of full-bodied red wine (a good complement to oak or maple wood smoke), while out in the woodshed ($1,600), the mice and rust nibble away at your chainsaw ($500), log chains ($175), axe ($49), splitting maul ($57), hydraulic wood splitter ($1,100), and various accessories ($200-$1,000). We’ll let you pretend that the four-wheeler ATV, heavy duty hauling cart, steel-toe boots, hard hat, hearing protectors, leather work gloves, and safety glasses were purchased for other purposes than the firewood project and can be removed from the debit sheet. So, amortized over the next ten years, you’re paying only about $50 per dose of cozy woodstove ambience. Fortunately, I do love cutting firewood. And splitting it. I have learned to like hauling and stacking, but those will never match the torrid love affair I have with my Stihl chainsaw and splitting mauls. When we bought our 150-year-old farm house and surrounding woodlots, I rushed madly, recklessly into the relationship. Yes, I have paid in pain and suffering for my impetuosity and passion, but it has been worth it. No regrets. My playground is my back yard. Literally. Our acreage is a woodland clumsily and wantonly logged in the 1970s and destructively grazed by cattle in the 1980s. Neglected and unused for a decade it regenerated in stands of fast-growing trees: box elder, elm, soft maple, aspen, plum, wild cherry – densely interspersed with red cedar, prickly ash, wild raspberry, gooseberry, and bountiful burdock. Tender stems of oak, walnut, hickory, hard maple, ash, butternut and other hardwood species also emerged from the forest floor, but most were devoured by deer and rabbits. The “undesirable” tree species were unmolested and thrived. Especially the elms. At least until their bark grew sufficiently thick to attract Hylurgopinu rufipes, the elm bark beetle, which bores into the tree and infects it with Ophiostoma novo-ulmi, commonly known as Dutch elm disease. This virulent fungus kills the tree over the course of several years through a sort of auto-immune reaction that results in self-strangulation. It does not, however, send the elm species spiraling into extinction, as chestnut blight exterminated the American chestnut tree, because during their ten to fifteen years of life the elms shower down thousands of seeds (encased in those wonderful ‘helicopter’ seed pods) and spike up ‘suckers’ from their root systems, procreating future generations of trees – which will soon contract the insect-borne fungus and begin their slow death. Over a forty-year period, about 1960-2000, Dutch elm disease killed hundreds of thousands – perhaps millions? – of the magnificent elm trees that shaded the parks and streets of eastern and Midwestern towns. The ten to fifteen-year life of the elm tree has made it a species of no economic value, except as firewood. The hardwood trees of my woodlands have now matured, canopied, and shaded out much of the undergrowth. Dozens of dead elms stand naked of bark, awaiting a strong wind to bring them down to their ultimate destination: my woodstove. A rough inventory suggests there will be sufficient firewood for another twenty years, longer than I will be physically able to harvest it. But there is elm, and then there is elm. More specifically, there is white elm, also called American elm, ulmus Americana; and there is red elm, also called slippery elm, ulmus rubra. The two species both have the twisted, spiraling grain that makes them difficult to split. But the similarity ends there. After a few years of heating with wood, you can distinguish white elm from red elm at a glance, but even if you could not, the character of the wood reveals itself with the first bite of the chainsaw. White elm is butter, red elm is iron. White elm is firewood only in the sense that it does burn and produce fire and some heat. Plentiful in my woodlands (white elms outnumber red elms by a factor of about eight-to-one), it is also plentiful in my woodpile because when a white elm comes down it usually has to be cut up and removed to plant an oak or walnut or maple seedling in its place. In my stove, small splits of white elm burn fast, produce relatively little heat, and leave much ash. Big splits have to be coaxed to burn at all, with flue wide open, and the sputtering flames produce barely enough heat to bring to boil the teapot atop the stove. Red elm is the ne plus ultra of firewood. Hard and heavy, even small splits burn for hours, producing huge numbers of BTUs. Big splits burn hot and steady through the night, leaving a generous bed of glowing coals to rekindle the fire in the morning. One cord of red elm is worth four cords of white. When I find a red elm fallen, or ready to be felled, there is much celebration. And in addition to the joy it brings me, this firewood hobby (obsession? passion?) heats my home for free. Well, for minimal cost. Less than LP gas, anyway. Probably. I’ll do the numbers later. For now, I’m warming my feet by the woodstove. I’m an urban guy. I clean the ashes out of my fireplace and throw it into one of two compost piles. Supposedly, the compost pile will be thanking me some day. Never knew Seagrave was also a poet…how delightful!! !